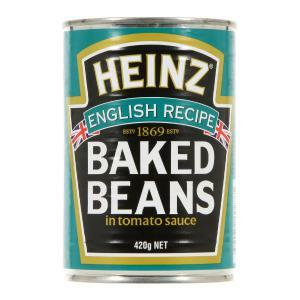 The Great Baked Beans Conspiracy | Mike Hitchen Online: Mike Hitchen Unleashed - telling it like it is! There appears to be an international conspiracy going on. A conspiracy that gives every perception of being - sabotage! When I say dented, I don't just mean a barely visible indentation near the bottom of a can, I mean they look like they have been hit by a Sydney driver trying to negotiate a roundabout. 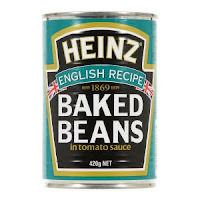 Every other variety of Heinz baked beans is left unscathed, it is only the English Recipe that has been targeted. Are there home grown baked beans extremists in our midst, who have been radicalized by the mass media's incessant agenda to 'Buy Australian" even though it's crap and twice as expensive as imported products would be if incompetent, greedy self interest groups known as trade unions and farmers, allowed us to? Why is the Baked Beans in Ham Sauce, in perfect condition, so too the BBQ sauce variety? Perhaps someone involved in the distribution process has had their phones hacked by News of The World and are exacting their revenge on the bean counters! If I wanted to buy something that is battered, I wouldn't buy baked beans - I'd buy fish fingers! Heck, I don't even like baked beans!